Eclipse Galileo was released yesterday and I have already seen a couple of questions on the newsgroups regarding how to install the delta pack. For those who don't know what it is, the delta pack is a zip file provided by the Eclipse Platform and it is used for developing RCP applications for multiple platforms. The delta pack archive contains all the platform specific fragments from the Eclipse SDK. It also includes a feature "org.eclipse.equinox.executable" which contains binary launchers for all the platforms. The archive is available for download through the Eclipse Classic "Other downloads" page. If you don't have the delta pack installed, then the option to export your product for multiple platforms will not appear in the wizard. Ian Bull blogged about the improved Target Platform management system as #3 in his Galileo Feature top ten list. This is the recommended method of installing the delta pack. Extract the delta pack archive into its own directory on disk. Open the Target Platform preferences (Window -> Preferences -> Plug-in Development -> Target Platform). Add a new target, or edit the active target. Add the directory where you extracted the delta pack. In my last post I showed how to create a simple feature patch. However, this patch leaves us in a state where we can no longer upgrade the platform because the patch itself requires a specific version of the feature it is patching. If we make the inclusion of the patch in our org.example.feature optional, then we no longer block upgrading the platform underneath us. When a new version of the platform is available, there is a conflict between the version of the p2.user.ui feature required by the patch and the one required by the new platform. By making the patch optional, p2 will not install the patch if there is a conflict. This is fine if the new version of the platform includes the fix we want. But what if it doesn't? What if we need to have our patch apply to several different versions of the platform? Here we see the patch applies to a specific version of the org.eclipse.equinox.p2.user.ui feature. By relaxing the version range here we can make the patch apply to other versions of the platform. For example, say we knew our bug was fixed on June 11, but there were several version between June 5th and the 10th that still contained the bug. We could instead use a version range like [1.1.0.v20090605-1440,1.1.0.v20090611) (the upper end of the range is open, it includes everything up to but not including v20090611). Note that the patch Installable Unit also has normal requirements on the feature it is patching. When widening the scope range, the regular requirements should also be widened to match. The 'changes' section of the patch's metadata specifies which plug-in we are patching, and the version to change it to. 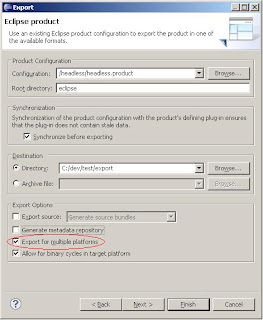 In the above example, we are changing the org.eclipse.equinox.p2.touchpoint.eclipse bundle from any version ("0.0.0") to version 1.0.101.v20090611. Change the "scope" range to "0.0.0" to match any version of the p2.user.ui feature, and then change the "change from" range to [1.0.101, 1.0.101.v20090611). This would result in patching any version of the p2.user.ui feature that includes any 1.0.101 versioned bundle up to v20090611 (which is the version with the proper fix). Change the "change to" range to something like [1.0.101.v20090611, 1.0.102). We know v20090611 contains the fix we want, but the in the future there will be more bug fixes before the maintenance stream is released. By widening the range here, we allow future bug fixes to also be included in our patch.